There are temporary trends and then there’s just plain, good design, the former fleeting and the latter lasting over time. I categorize Volvo into the more enduring aesthetic, its cars appealing to those who prefer minimalist modernism to showy glitz and glamour. Of course, open its substantive driver-side door, lower yourself into the S60's handsome cabin, take grip of its thick leather-wrapped sport-shaped steering wheel and you’ll soon realize the S60 is endowed with considerable swagger of its own. It meets all premium level attributes, with fabric-wrapped roof pillars front to back, high-quality soft-touch synthetics used almost everywhere that satin-finish aluminum and supple leather are not, switchgear that’s superbly crafted throughout, the vertical grouping of buttons and rotating knobs flowing down its floating centre stack some of the nicest in the segment, true eye candy for the high-end home audio crowd, while its electronic displays are totally up to date with full-colour, crisp, clear resolution, and impressive functionality, the driver-configurable primary gauge cluster absolutely gorgeous and filled with useful features, albeit designed in the same effortlessly uncomplicated fashion as the rest of the car. Subtle details like a speedometer that only lights up its numerals as the needle approaches a given speed, a thoughtful way to minimize nighttime distraction, shows the lengths Volvo is willing to go in order to enhance the S60 ownership experience. Opting for an S60 won’t leave you wishing for unobtainable features either, with most of the luxury industry’s latest kit included in the $51,400 T5 AWD SE Premier trimmed example I tested; the base S60 starts at $38,800 plus freight and dealer fees. SE stands for Special Edition, a car that’s been optimized for Canada’s colder and wetter winters, longer nights and unique market tastes, with a standard feature set that includes active dual HID headlights with washers and auto high beams, an auto-dimming rearview mirror, rain-sensing wipers, a heatable steering wheel, three-way heatable front seats, heated rear seats, and dual-zone auto climate control, not to mention electronically controlled AWD that incorporates Instant Traction and torque vectoring Corner Traction Control, which means that power gets distributed as needed from side to side instead of just front to back, while advanced dynamic stability control with Sport mode makes sure that safety measures are met without diluting responsiveness, therefore making the most of this model’s upgraded Touring suspension. It snaps like a whip off the line too, which is a bit of a shocker when factoring in a mere 2.5 litres of displacement under the hood. The S60 is available with more engine, transmission and driveline options than most rivals, this particular example infused with an inline five-cylinder that sports 20 valves and dual overhead cams plus a turbo and intercooler, which is collectively good enough for 250 horsepower and a considerable 266 lb-ft of torque from as little as 1,800 rpm, that when combined with a proven adaptive shift-enhanced six-speed automatic transmission feeding all four wheels results in the responsive acceleration just noted, or alternatively when focused on fuel-efficiency you can eke out a claimed 10.1 L/100km combined city and highway. The best part is that I could drive this car all day without feeling tired, its immediate reaction to input and overall comfort combining for a tirelessly invigorating experience overall. All this along with the types of practicalities expected in a roomy four-door sedan plus a host of standard features not yet mentioned such as silver detailing on the stylish lower front fascia and the same silver for the rear diffuser, a sizable rear deck lid spoiler, convenient proximity-sensing keyless access with pushbutton ignition, an electromechanical parking brake, adaptive cruise control, front and rear parking sensors, an easy-to-use and fully featured 7.0-inch Volvo Sensus infotainment display with a reverse camera, excellent stereo sound quality plus HD and satellite radio, full smartphone connectivity with audio streaming, Volvo ON Call (that lets you access your car from your smartphone), memory for the powered seats and side mirrors, a powered moonroof, power foldable rear headrests, 60/40 split-folding rear seatbacks to expand the trunk’s capacity, a separate centre pass-through for longer items like skis, City Safety autonomous braking, blind spot monitoring with rear cross-traffic alert, lane departure warning, lane change merge aid, collision warning plus pedestrian and cyclist detection with full auto braking (Volvo is a leader in such technologies) and yet more active safety features that, when equipped, earn the S60 a Top Safety Pick + rating from the IIHS, whereas all S60 trims benefit from the best possible full 5-star NHTSA crash test rating. 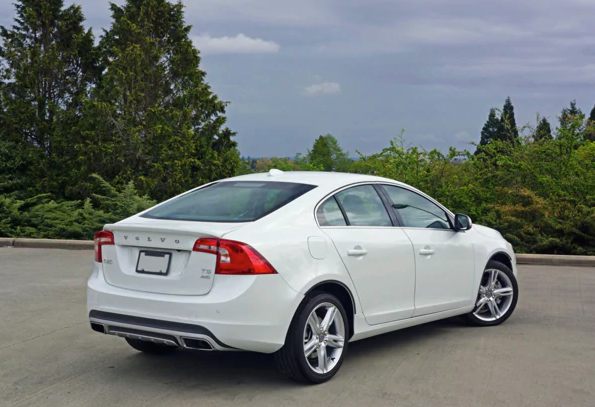 Despite all of these active and passive safety technologies working away behind the scenes, the S60 wasn’t actually designed for those who like being titillated with complexities. It’s more about simplifying processes so that you can enjoy the art of driving, whether that be a relaxed cruise kicking back to Purple Rain on your way back from the office or the unexpected challenge of a previously unknown back road taken at speed, this Volvo is ready when you are. The S60 delivers one of the best combinations of luxury, performance and value in its highly contested segment, and therefore deserves your full attention.